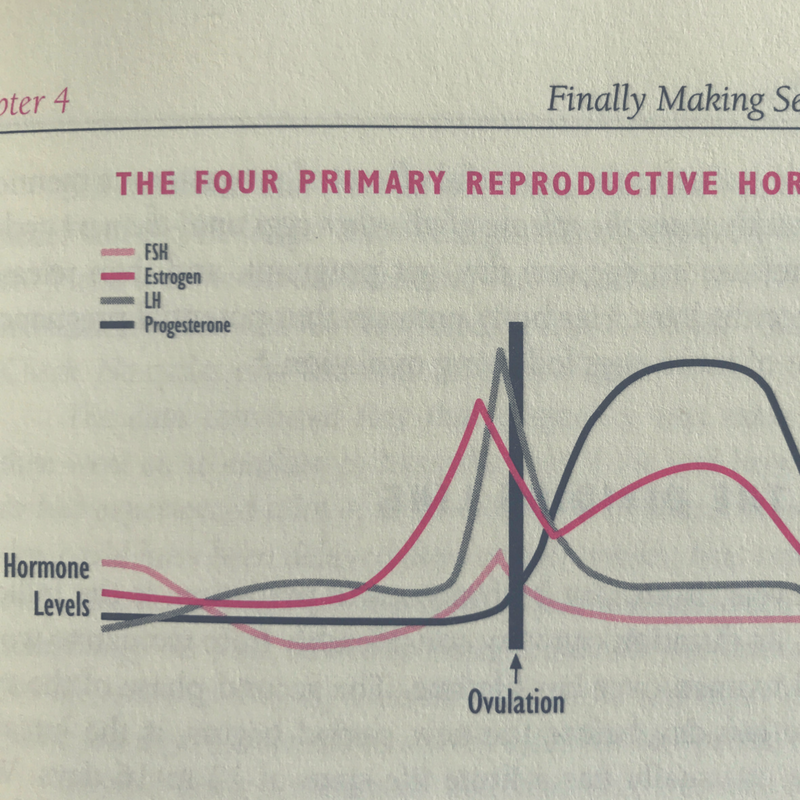 I just need to know - does anyone out there understand the diagrams or graphs related to womens cycles, the graphs that show when FSH / Estrogen / Progesteron and LH, is being produced - or when ovulation or menstruation happens? Like this graph... does it make any logical or practical sense to you? Does anyone really know what a luteal phase is? Or what that even means in the grand scheme of things? I'm a nurse (and I know I really shouldn't say this, but it's true...) we sat down (it was 2003) and spent a solid day looking at all that stuff - and I've gotta tell you - I definitely didn't get it. I know I shouldn't say that, but honestly, it made zero sense to me. I felt like I was reading a map in Chinese. And I'm guessing if it made zero sense to me - it's the same for other women out there? It's only since we decided that my husband wouldn't get the snip, that it became REALLY important for me to understand WHAT ON EARTH IS GOING ON IN MY BODY?! Because in a nutshell - me understanding my fertility, is our contraceptive plan. I KNOW. So despite the fact that I've always been fascinated by my cycle - it's taken me until my 30's to really start to understand it.......Annnnd I thought I'd just share a few basics with you - incase you're confused by the graphs too. A cycle "begins" at day 1 of your period - and lasts until you start bleeding again. The day you start bleeding again is the next cycle. So if you count from the day you start bleeding - until the day before your next bleed - thats the total length of your cycle. Day 1 of your cycle - is the first day of your period, and when you get your period, the Follicular Phase starts. During the Follicular Phase - there are 3 main hormones: Follicle Stimulating Hormone + Estrogen + Luteinizing HormoneThe Follicular Phase generally last about 14 days - but can be slightly shorter, or much, much longer - even up to 30 days! Follicule Stimulating Hormone (FSH) peaks, and then drops away, just before ovulation - It's role is to help the eggs in the ovaries mature. (Each cycle 15-20 eggs will begin a race, to be the most mature egg and be released at ovulation). The eggs are each encased in their own follicle. Estrogen / Oestrogen (same thing different spelling), is produced by the follicles that surround the eggs. Estrogen levels increase, throughout the Follicular phase, until the body reaches a threshold for the estrogen. Once Luteinzing Hormone surges, (because of the high levels of Estrogen), an egg is released from the ovary by the most dominate follicle. This is OVULATION! (If you're wondering what happens to the other 19 or so eggs that were in the race.....they disintegrate). Ovulation is when the egg is released out of the follicle that it was incased in - and out of the Ovary that all the eggs are in.....After ovulation........The egg gets picked up by the fallopian tube and moves down the tubes towards the Uterus. Which day you Ovulate on (day 12, day 14, or day 30 etc) depends on YOU, it can vary from woman to woman - and can vary for each woman individually, depending on so many factors.....what's going on in your life, your environment, your thinking, your stress levels, your relationships, your phase of life, the moon, the world, etc.......all of that can play a part in how long the Follicular Phase (day 1 of your Period - until Ovulation), lasts - amazing ah?! Usually women have a general, "normal for them", time frame for the follicular phase. .....(and Estrogen hangs around too - but to a lesser degree than in the Follicular Phase where it has a massive peak. When the egg has been released from the Ovary, (and the Follicle) - the Follicle then collapses, stays in the ovary wall, and becomes the Corpus Luteum. The Luteal Phase is usually between 10 - 16 days and can not last longer than that (I've read), because the Corpus Luteum has a limited life span - so this phase of your cycle is usually very predictable (within a day or two for most women). The Corpus Luteum has a VERY IMPORTANT job - it releases Progesterone. Causes the lining of the uterus to thicken - incase you're egg has met a sperm and needs to burrow in and be looked after before the placenta starts to form. Relaxes the central nervous system, and binds to the same receptors in the brain as valium! Progesterone has calming, soothing, and relaxing effects (according to Dr. Christian Northrup in her book Womens bodies Womens Wisdom). And according to Dr. Libby Weaver, its an antidepressant, antianxiety agent, and a diuretic (makes you wee more). NB Synthetic hormones aren't the same as the ones your body naturally produces - so don't rush out to start the progesterone only contraceptive pill! Synthetic Progesterones have known side effects.....nausea, bloating, problems urinating, rash, hives, vaginal bleeding, sweating, headaches.....and so much more! AND I didn't pick out any of the "rare" side effects listed!! When the Corpus Luteum disintegrates - Progesterone drops off dramatically, as does Estrogen.......and you get your PERIOD! Back to day 1! All of these hormones are present throughout your cycle - at varying levels - and what I've described is a VERY basic overview - but hopefully it might help you understand a little more about your cycle, your hormones and all that's going on inside your body, on any given day. It's total Magic! Don't hesitate to comment, or message me privately if theres something you want to share, or ask - I'd love to hear from you. Womens’ Coach, Writer, Rgistered Nurse. I help women connect the dots between their lives and their cycles. What don't you get about your cycle? Aug 24 Are you committed?